فرجی, الهام, افشار, عباس, فیضی, فرزانه. (1394). تخصیص بار آلاینده با رویکرد مجموع حداکثر بار آلاینده روزانه با استفاده از الگوریتم کاوش سیستم ذرات باردار. مجله آب و فاضلاب, 27(1), 67-80. الهام فرجی; عباس افشار; فرزانه فیضی. "تخصیص بار آلاینده با رویکرد مجموع حداکثر بار آلاینده روزانه با استفاده از الگوریتم کاوش سیستم ذرات باردار". مجله آب و فاضلاب, 27, 1, 1394, 67-80. فرجی, الهام, افشار, عباس, فیضی, فرزانه. (1394). 'تخصیص بار آلاینده با رویکرد مجموع حداکثر بار آلاینده روزانه با استفاده از الگوریتم کاوش سیستم ذرات باردار', مجله آب و فاضلاب, 27(1), pp. 67-80. فرجی, الهام, افشار, عباس, فیضی, فرزانه. تخصیص بار آلاینده با رویکرد مجموع حداکثر بار آلاینده روزانه با استفاده از الگوریتم کاوش سیستم ذرات باردار. مجله آب و فاضلاب, 1394; 27(1): 67-80. 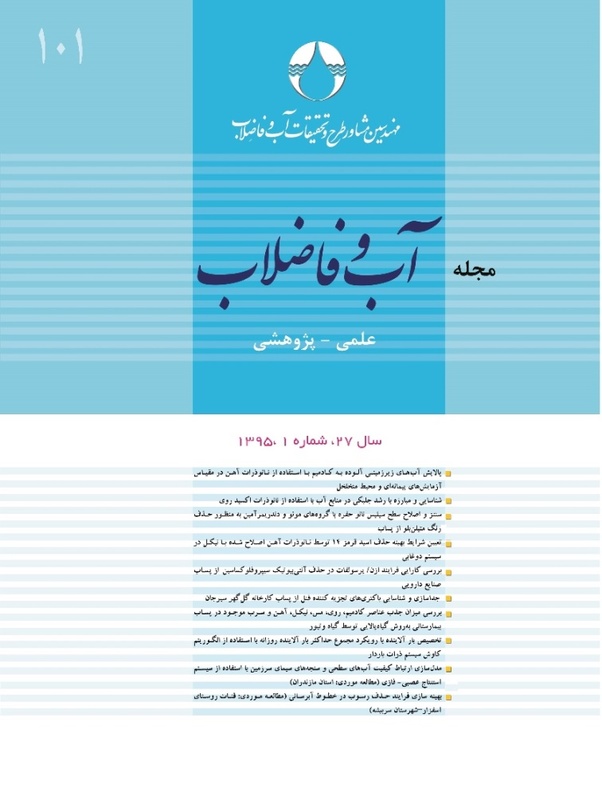 در این پژوهش قابلیت الگوریتم کاوش سیستم ذرات باردار(CSS) در حل مسائل بهینه‌سازی مهندسی آب بررسی شد. ابتدا دو نمونه از مسائل نسبتاً پیچیده ریاضی توسط الگوریتم CSS حل شد و نتایج آن با نتایج سایر الگوریتم‌های فراکاوشی مقایسه شد. در انتها کاربرد مدل بهینه‌سازی توسعه داده شده توسط الگوریتم CSS در تخصیص بار آلاینده با رویکرد مجموع حداکثر بار روزانه (TMDL) در رودخانه، نشان داده شد. به‌منظور قضاوت درست از کارایی این الگوریتم، نتایج در قالب جداول و نمودارهایی ارائه شد. نتایج نشان داد سرعت الگوریتم مذکور نسبت به سایر الگوریتم‌های فراکاوشی بیشتر است و دقت آن نیز در حل مسائل بهینه‌سازی مهندسی آب رضایت‌بخش است. In this research, the capability of a charged system search algorithm (CSS) in handling water management optimization problems is investigated. First, two complex mathematical problems are solved by CSS and the results are compared with those obtained from other metaheuristic algorithms. In the last step, the optimization model developed by the CSS algorithm is applied to the waste load allocation in rivers based on the total maximum daily load (TMDL) concept. The results are presented in Tables and Figures for easy comparison. The study indicates the superiority of the CSS algorithm in terms of its speed and performance over the other metaheuristic algorithms while its precision in water management optimization problems is verified. 1. Burn, D.H., and MCBean, E.H. (1985). “Optimisation modeling of water quality in an un certain environment.” J. of Water Resource Res., 21 (7), 1985, 934-940. 2. Loucks, D. P., Stedinger, J. R., and Haith, D. A. (1981). Water resource systems planning and analysis, Prentice-Hall, Englewood Cliffs, N.J.
3. Thomann, R.V. (1972). System analysis for water quality management, McGraw- Hill Inc., New York. 4. Loucks, D.P., Revelle, C.S., and Lynn, W.R. (1967), “Linear programming model for water pollution control.” Mgmt. Sci., 14(4), 166-181. 5. Dorfman, R., Jacoby, H.D., and Tomas, H.A. Jr. (1975). Models for managing regional water quality, Harvard University Press, Cambridge, Mass. 6. Cardwell, H., and Ellis, J.H. (1993), “Stochastic dynamic programming models for water quality management.” Water Resource Res., 29(4), 803-813. 7. Hsieh, C. D., and Yang, W. F. (2006). “Study of total maximum daily load and non-point source pollution control strategies for reservoir watershed.” Practice Periodical of Hazardous, Toxic, and Radioactive Waste Management, 10(3), 134-143. 8. Borah, D. K., Yagow, G., Saleh, A., Barnes, P. L., Rosenthal, W., Krug, E. C., and Hauck, L. M. (2006), “Sediment and nutrient modeling for TMDL development and implementation.” American Society of Agricultural and Biological Engineers, 49(4), 967-986. 9. Zhijun Liu, Janna M., Kieffer, William L. Kingery, David H. Huddlestonc, and Faisal Hossain. (2007). “Watershed modeling of dissolved oxygen and biochemical oxygen demand using a hydrological simulation Fortran program.” J. of Environmental Science and Health, Part A: Toxic/Hazardous Substances and Environmental Engineering, 42, 2023-2032. 10. Karamouz, M., and Baghvand, A., and Taheriun, M. (2009). “Evaluation of total maximum daily load of nutrition in basin to reservoir.” The 3rd Conference and Exhibition on Environmental Engineering, Tehran, Iran. 11. Chen, H.W., and Chang, N.B. (1998), “Water pollution control in the river basin by fuzzy genetic algorithm-based multi objective programming modeling.” Water Sci. and Technol., 37(3), 55-63. 13. Hoseinzadeh, H., Afshar, A., and Sharifi, F. (2010). “Multi objective waste load allocation using multicolony ant algorithm.” Iran Water Resource Research, 6 (2), 10-13. 14. Kaveh, A., and Talatahari, S. (2010). “A novel heuristic optimization method: Charged system search.” Acta Mechanica, 213 (3/4), 267-289. 15. Kaveh, A., and Talatahari, S. (2010 c ). “Charged system search for optimum grillage systems design using the LRFD -AISC code.” J. of Constructional Steel Research, 66 (6), 767-771. 16. Kaveh, A., and Talatahari, S. (2010d). “Optimal design of skeletal structures via the charged system search algorithm.” Structural and Multidisciplinary Optimization, 41 (6), 893-911. 18. Kaveh, A., and Talatahari, S. (2010 b). “A charged system search with a fly to boundary method for discrete optimum design of truss structures.” Asian Journal of Civil Engineering, 11 (3), 277-293. 19. Kaveh, A., and Talatahari, S. (2011). “ An enhanced charged system search for configuration optimization using the concept of fields of forces.” Struct. Multi Discip optim., 43(3), 339 -351. 20. Gen, M., and Cheng, R.W. (1997). Genetic algorithms and engineering design, John Wiley and Sons, Inc., NY. 24. Colorado River Basin RWQCB. (2006). “Draft 9-11-06. TMDL and implementation plan for dissolved oxygen in the New River.” Imperial County, California. 25. Annual Project Report. (2006). imperial irrigation district’s revised drain water quality improvement plan. <http://iid.com/homsshowdacumentid=385>>, (Dec. 2006).